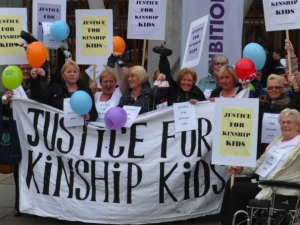 We feel we must urgently act now to stop the Scottish Government’s Children and Young People’s Bill taking away some of the little support which Kinship carers currently have under their proposed Kinship Care Order. This is a crucial time for children in Kinship Care and we need all the support we can get. Kinship Carers save the government hundreds of millions of pounds a year in saved care costs, and provide the best caring possible for children unable to live with their parents. Yet, rather than being thanked and supported, they are being sidelined and denied even the most basic forms of support for the children in their care. This is a disgrace, and also a violation of Human Rights legislation on discrimination. Primarily, Kinship Carers are demanding basic therapeutic services to help the often traumatised children in their care integrate in schools and family life, and grow up healthy and happy. 1. Don’t cut the support for children in Kinship Care, as planned in the Children and Young People’s Bill. 2. We oppose the Kinship Care Order and demand an increase in investment for the support of children in Kinship Care. 3. End the discrimination between ‘formal’ and ‘informal’ Kinship children. 4. Children of comparable need must be treated the same. 5. Trauma and therapeutic services should be available to all Kinship children, despite their legal status. Please come to Edinburgh to join our demonstration at 11.30am outside the main entrance of parliament, or write letters or statements of support to us, or to the Minister for Children and Young People Aileen Campbell (Aileen Campbell MSP, The Scottish Parliament, Edinburgh, EH99 1SP). Do send this out far and wide and try to get as many folk along to Edinburgh as possible. We must show that Kinship Carers are not an isolated group who can be sidelined, but are widely supported by others. I support you all the way children are our future. What future would those children have if it was not for kinship carers. this is a shocking way to treat people who have already giving there all for there grand child/children or siblings children to get them a better standard of life and to break cycle give these kids emotional and proffessional help also financial help to provent the next generation from bieng a strain on the already stretched budgets the old saying( prevention is better than the cure ) its not rocket science but seems to be ignored poverty is real in scotland and to break the already spiral of kids bieng taken into foster care or local goverment care invest in these already troubled kids invest the time now to get future of scotland into a better family unit that will give them chance to have a better future for generations to come. 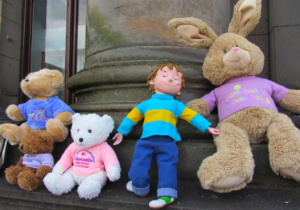 The Petition for A children’s Monument Please sign you could Stop Child Abuse.